This is part two in a series of informational posts for first time homebuyers. Being a first-time home buyer if you are a millennial can be tricky. Typically buyers in this age cohort carry student loan debt. According to a study by American Student Assistance, 55% of student loan holders said their debt is causing them to put off homeownership. And despite the historically low levels of today’s mortgage rates plus a wide array of low- and no-downpayment mortgages available to first-time buyers, student-loan-holding consumers are discouraged. Many would-be buyers aren’t even applying — worried that their debts will make homeownership impossible. The truth though, is that student loan debt does not preclude you from purchasing a home. Down payment matters because the size of your down payment determines which mortgage loans you might be eligible for. For example, the VA mortgage and UDSA home loan both allow for 100% financing. Therefore, if you plan to use either of these two programs, it doesn’t matter whether you have a down payment or not. With an FHA mortgage or a conventional one, which require 3.5% down and three percent down, respectively, you only need a minimal downpayment. There are even downpayment programs for as little as 1%. Your credit score matters for the same reason. All mortgage programs require that buyers meet some minimum credit score requirement. For some programs, minimum credit scores are high. For other programs, minimum credit scores are low. Your credit score will determine which mortgage programs you might be eligible for. It’s your monthly income relative to your debt (DTI), however, that is arguably the most important trait in your mortgage loan approval. The DTI calculation is believed to be the best predictor of whether you can actually afford to buy. 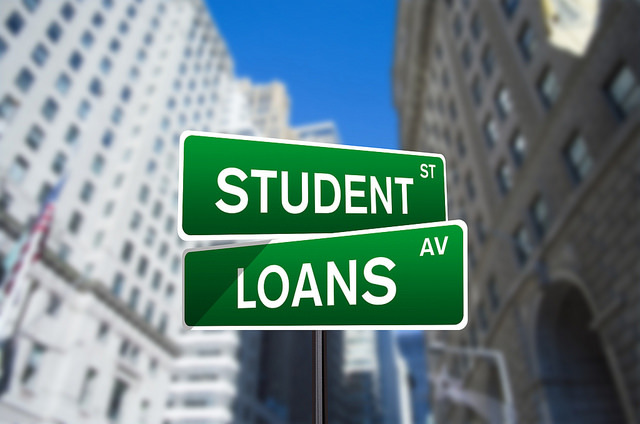 How Do Student Loans Affect Mortgage Approvals? Your debt-to-income ratio is a percentage which shows the amount of your monthly income required to repay your debts. For example, if you earned $5,000 per month and had a monthly debt obligation of $2,000, your debt-to-income ratio would be 40%. DTI is heavily influenced by where you live. So for example, residents of San Francisco, where rents are relatively high tend to exhibit higher ratios than residents of Kansas City, where rents are relatively low. For first-time buyers with student loans using every available piece of DTI may be necessary. This is because student loans can eat into your budget and redirect monies you’d rather be putting toward housing. Consider that the average college student graduates with monthly debt totaling $300 per month. Add a car payment and a few credit cards, and monthly debt more than doubles to eight hundred dollars per month. But, student loans don’t have to be a barrier to entry. You have means to reduce your monthly student loan payments, which can help you with your home loan approval. Student loans affect your monthly budget which, in turn, affects your DTI. However, there are ways to reduce what you owe to the government each month to help you qualify for “more home”. One method by which to reduce your monthly student loan obligation is to switch to a graduated repayment plan on your loans. A graduated repayment plan is one for which the payment starts low, then rises every two years to meet the rising income of a typical college graduate. With lower monthly payments, your debt-to-income ratio is reduced, which can help you qualify for your home loan. Loan consolidation is another way to reduce your monthly student loan obligation. It’s likely that your student loans are of different amounts, and at different interest rates. By consolidating your loans, you can lump your principal balances together at, hopefully, a lower interest rate. You can also request a lengthening of your payback period, known as your “term”. By lengthening your term to 15 years or 20 years, you can reduce the amount that you owe each month, which lowers your DTI. This will increase the long-term interest costs of your student loans, but will lower your monthly obligation. A third option that doesn’t relate to student loans at all are credit card payments and other monthly debts. If graduated payments and student loan debt consolidation are not part of your plans, consider reducing your high-balance credit cards or any other debt which carries a high minimum monthly payment. For example, if you have a credit card which requires a minimum monthly payment of $150, and that’s more than your other credit cards, you can reduce that card’s balance, which will reduce the monthly payment due, which helps to lower your DTI. As a first-time home buyer with student debt, there are a number of mortgage loan programs well-suited for your needs. Many allow for low-downpayment or 100% financing as well. The FHA loan, for example, which is backed by the Federal Housing Administration (FHA), allows for a downpayment of just 3.5 percent for borrowers with a credit score of 580 or higher. FHA loans may allow higher debt-to-income ratios on a case-by-case basis. You can also use the FHA home loan if your credit scores are below 580, but a larger downpayment of 10 percent is required. The Fannie Mae HomeReady™ mortgage is another loan available to borrowers with student loans. Via HomeReady™, buyers can show a debt-to-income of up to 50%, with certain off-setting factors; and a down payment of just three percent is allowed. The minimum credit score to get approved for a HomeReady™ home loan is 620. Buyers with military experience who have student loans should also consider the VA Loan Guaranty program available as part of the G.I. Bill. VA loans allow for 100% financing and, according to loan guidelines, the maximum debt-to-income ratio can be over-ridden if some of your income is tax-free income; or, if your residual income exceeds the acceptable loan limit by twenty percent of more. First-time home buyers tend to have lower credit scores than the general population, but don’t despair. There are plenty of mortgage programs meant to help first-time buyers move into homeownership. To get started in this process, contact one of our experienced agents who can introduce you to lenders who will work with you on your particular situation.